Where ever we live we try to capitalize on what the place has to offer. In doing that we find ourselves doing things we never ever would have thought of doing. When I first moved to Seattle from California I never thought "oh, I think I'll learn to scuba dive in 50 degree water." Ended up doing it from 1990 until we left for Puerto Rico in 2007. Not only did I dive but I photographed everything that lived in Puget Sound (never thought I'd do underwater photography either). Did I foresee selling my photographs? Nope but I did that for 7 years also. Kayaking...didn't do that until I met Jeff. We did ocean kayaking, river kayaking and even played kayak water polo! In Puerto Rico the big new thing was caving. Best thing we ever did so we did a lot of it! We also tried surfing and did a lot of diving and some kayaking. Well now we are in New Mexico (never thought we'd live here). There isn't any diving, we don't have kayaks yet (not many bodies of water to kayak on), caving has turned out to be a bust (dust holes and too many permits required and just not fun) but there is a lot of wonderful hiking and there are a lot of rocks! We needed to expand our activities. I am a Master Gardener so I have that in the spring and summer. Jeff has been trying to bust into some caving but it has proved difficult. I decided we should try the Albuquerque Gem and Mineral Club. This has turned out to be our new big thing and it is great! I have always been interested in the natural world. Anything animal, plants, fossils and of course rocks! This club is very organized (I am not really a club person) and best of all there is a monthly rock collecting trip that usually goes to a private claim someone has at a mine. These trips bring us to places we wouldn't otherwise have access too and brings us to remote spots in New Mexico that we would never have a reason to go to. The next logical step was to do something with our treasures. We have some nice big minerally rocks that are "yard rocks." We have a lot of nice smaller things we have collected because they are neat and we like them - these are currently in a woven basket where they can be seen as the sun moves across them during the daytime. Other specimens are in bottles or placed around the house. Soon we will build a shelf in the courtyard so they can move outside but for some nice pieces we are having them cut and we take them to the lapidary lab! So here is the deal...as a member of the club we got to had to take a 4 hour course about the Natural History Museum and its Lapidary Lab. Upon completion of the class we got a volunteer badge that gives us access to the lab as well as museum programs, discounts, free admission etc. 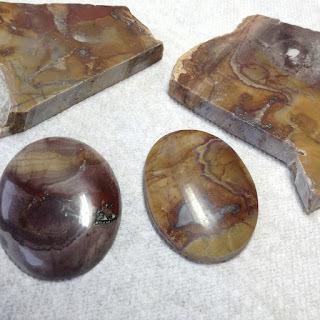 The lab has a trim saw and all the sanding/polishing wheels used to turn rock into cabochons which are basically domed polished stones ready for use in jewelry. For 5 dollars a session (4 hours) we can use all the equipment AND we get free instruction by club members who know how to do this stuff! In addition to that there are club members who can cut large rocks into slabs which is what we can use in the lab. My first session was myself and the instructor. 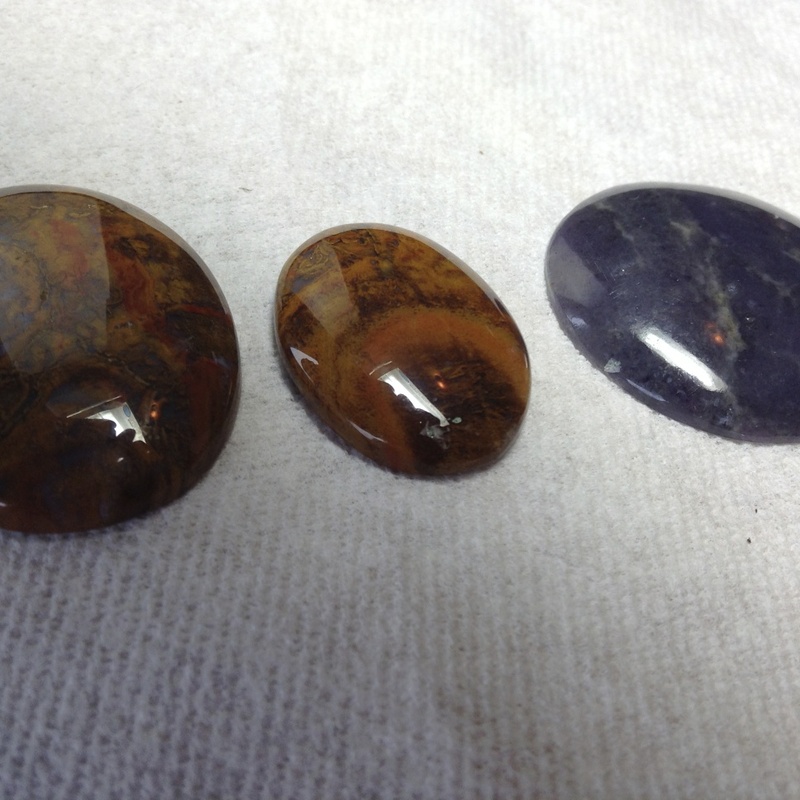 Carolyn makes jewelry herself so I learned how to make my first cabochon with her skills and perspective. I picked a slab to cut and proceeded over a couple sessions to make a cabochon. It isn't perfect but it is pretty good. It is really fun taking a piece of rock and turning it into a shiny smooth object. I thought the rock looked like it had a little bird sitting on a stump so I selected that section and made my thing. I still and some stone left so I made some smaller pieces for earrings maybe. The next session Jeff came along and it was with a different instructor - Joel. 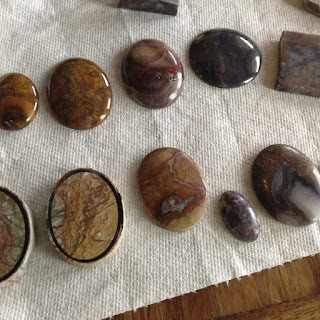 He gave us each a slab of candy cane rhyolite (we couldn't make it to that field trip).. Jeff and I roughed out our cabs and even though they were from similar slabs our selections made them polish up to look very different. Joel made a smaller cab from the same slab and gave it to Jeff - the part he selected came out very different too. Jeff lucked out on another session when a piece of a what looked like a grey stone was left on the table. Jeff made it into a circular cab and it is a really pretty blue in the light. I started working on a greenish slab. I am making two cabs. I may use some of what I've made in jewelry but at this point it is just fun to see how the rock will look polished. It is kind of meditative to do ... standing at a wheel grinding rocks into shapes with circular motions and water and pressure and rock smells. Definitely fun. So for me the next step is to take some jewelry making classes so I can do stuff with them. We are wondering what stuff should/could be tumbled rather than cut. 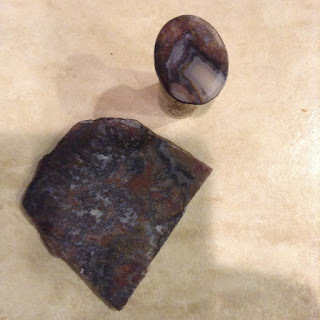 We are looking forward to the next trip which is for thunder eggs and geodes which I guess we smack open and then grind and polish one side of? Not sure what we can do with them but we'll find out. Jewelry making classes will be a good winter activity and give me something to do inside when it is cold and dark out. When spring arrives though it'll be gardening and more gardening. At some point we will have a box of polished cabs and we'll have to get more particular about what we take the time to work on but for now it is great just to see what things turn in to! We like exploring new areas of New Mexico and the geology is pretty awesome here. Hiking is wonderful and rock collecting/lapidary work has proven to be yet another thing I never would have thought I would end up doing!